Hammers are a potential type of melee Weapon in Ashes of Creation. Melee weapons have a maximum range of effect. Dual wielding will be permitted for one handed weapons. Shields cannot be dual wielded. Great swords probably can't be dual wielded. The ability to swap weapons while in combat will be decided based on testing. An early iteration of Alpha-1 has weapon swapping while in combat. 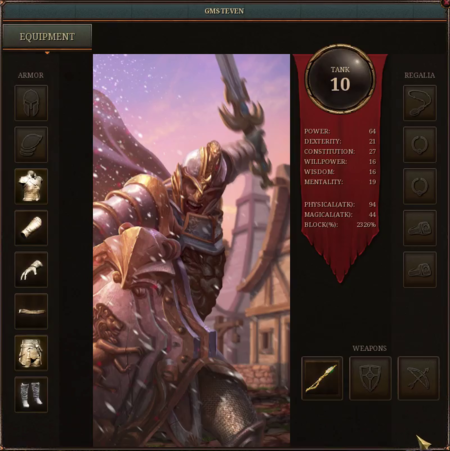 Players cannot switch gear (Armor) while in combat. ↑ Livestream, 28 July 2017 (45:21). ↑ Livestream, 9 February 2018 (7:31). ↑ Livestream, 28 July 2017 (24:54). ↑ Livestream, 30 June 2017 (47:14). ↑ Livestream, 16 June 2017 (40:06). ↑ Livestream, 28 July 2017 (33:36). ↑ Podcast, 4 August 2018 (1:16:10). ↑ Interview, 17 August 2018 (6:32). ↑ Livestream, 28 July 2017 (34:32). This page's content was last modified on 19 December 2018, at 16:23.